Ski jumping is a winter sport in which skiers go down an inrun with a take-off ramp (the jump), attempting to go fly through the air and land as far down the hill as possible. In addition to the length that skiers jump, judges give points for style. The skis used for ski jumping are wide and long (240 to 270 cm). 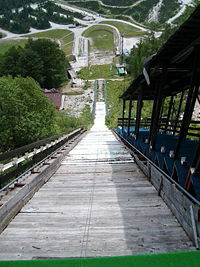 Ski jumping is part of the Winter Olympic Games, but can also be performed in summer on artificial surfaces (porcelain or frost rail track on the inrun, plastic on the landing hill). Ski jumping, like skydiving, is a sport practiced by those who enjoy the excitement and the risk of flying through the air. They are forerunners of the "extreme" sports that have become popular in the late twentieth and early twenty-first century, often referred to as an "adrenaline rush." This excitement is shared by participant and spectator alike. Ski jumping originates from Morgedal, Norway, and can be traced back to 1860, when Sondre Norheim, who is recognized as the "'Father of Ski Jumping," jumped a length of 30 meters without poles. Shortly thereafter, a competition was held in Trysil in 1862. The first widely recognized ski jumping competition was the Husebyrennene, held in Oslo from 1879. The annual event was moved to Holmenkollen from 1892, and Holmenkollen has remained the Mecca of ski jumping ever since. One of the reasons for this is because of the Norwegian royal family's decision to let the trophy be called the King's Cup. 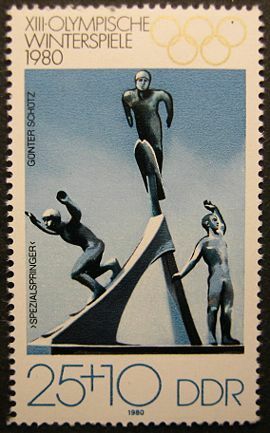 Ski jumping's next big event occurred when Thulin Thams and Sigmund Rudd developed the Kongsberger Technique. The move is a style of ski jumping that is based on bending the upper body at the hips, and leaning forward at a wide angle with arms extended forward. Because of this technique, ski jumpers started to increase their distances, leading to increased innovations in ski jumping technique. Sepp Bradl of Austria made history in the sport as the first person to jump at least one meter farther than the 100-meter mark in 1936. The sport increased in size and scope when it added a second event called the "large hill" at the 1962 FIS Nordic World Ski Championships in Poland. Jumpers such as Swiss Walter Steiner, the winner of the 1972 World Championship, and Toni Innauer of Austria, winner of the first FIS season in 1979-1980, helped move the sport forward. In 1988, the V-style of ski jumping was introduced. Before jumpers would always keep their skies parallel to their body. The V-Style, caused by rotating the feet and making a "V" shape with their skis, helped jumpers get an increased lift off the ramp. Since then, ski jumping has continued to evolve in its techniques and increased in skill level. It continues to be a popular sport not only for its enthusiasts, but with spectators as well. A ski jumper in Calgary, Canada. Today, World Cup ski jumping competitions are held on three types of hills: normal hills, large hills, and ski-flying competitions. Amateur and junior competitions are held on smaller hills. Individual Olympic competition consists of a training jump and two scored jumps. The team event consists of four members of the same nation who have two jumps each. Normal hill competitions consist of the rider usually reaching a K-point (see below) of 75 to 99 meters. The calculation line is found at approximately 80-100m, and distances of up to and over 110 meters can be reached. Two jumps are used on the normal hill consisting of the first and final round. In the first round 50 jumpers participate with the final round reduced to the 30 top jumpers from the first round. Large hill competition consists of the rider reaching a K-point of over 100 meters. The calculation line is found at approximately 120-130m with distances of over 145 m being obtained on the larger hills. Both individual and team competitions are run on these hills. Two jumps are also used on the large hills with 50 competing in the first round and the top 30 in the final round. Currently, women ski jump internationally in the Continental cup. On May 26, 2006, the International Ski Federation decided to allow women to ski jump at the 2009 Nordic World Ski Championships in Liberec, Czech Republic and then to have a team event for women at the 2011 world championships. FIS also decided to submit a proposal to the International Olympic Committee to allow women to compete at the 2010 Winter Olympics in Vancouver. On November 28, 2006, the proposal was rejected by the Executive Board of the IOC. The reason for the rejection cited the low number of athletes as well as few participating countries in the sport. The Executive Board noted that women's ski jumping has yet to be fully established internationally. More than 500 women ski jumpers from 14 different countries are participating in the FIS Continental Cup. The winner is decided on a scoring system based on distance and style. Each hill has a target called the calculation point (or K point) which is a par distance to aim for. This point is marked by the K line on the landing strip. For K90 and K120 competitions, the K line is at 90 m and 120 m respectively. Skiers are awarded 60 points if they land on the K Line. For every meter short/beyond this average, jumpers receive fewer/more points than the par 60 (1.8 points per meter). In addition, five judges are based in a tower that lies to the side of the expected landing point. They can award up to 20 points for style based on: keeping the skis steady during flight, balance, good body position and landing. The final score consists of the distance score plus the middle three style scores from the judges (the highest and lowest scores are ignored). For the individual event, the jumper with the best combined total from his two jumps is the winner. Aerodynamics has become a factor of increasing importance in modern ski jumping, with recent rules addressing the regulation of ski jumping suits. This follows a period when loopholes in the rules seemed to favor skinny jumpers in stiff, air foil-like suits. Jan Boklöv of Sweden, the creator of the V-Technique was one of the biggest innovators in changing the aerodynamics of the jump. Previous techniques first included the Kongsberger technique, developed in Kongsberg, Norway by two ski jumpers, Jacob Tullin Thams and Sigmund Ruud following World War I. This technique had the upper body bent at the hip, a wide forward lean, and arms extended to the front with the skis parallel to each other. It would lead to jumping length going from 45 meters to over 100 meters. In the 1950s Andreas Daescher of Switzerland and Erich Windisch of Germany modified the Kongsberger technique by placing his arms backward toward his hips for a closer lean. The Daescher technique and Windisch technique would be standard for ski jumping from the 1950s until the V-style technique was developed. The skiers have to touch the ground in the Telemark landing style. This involves the jumper landing with one foot in front of the other, mimicking the style of the Norwegian inventors of Telemark skiing. Otherwise style points are reduced. Ramps for Ski-Jumping are constructed on a ski hill that fits the variable needed for ski jumping. They consist of long-sloped ramps with a take-off point and a landing area. The design of the hill has a large impact on the distances that can be reached by the jumpers. Ramps are designed to be trained and competed on during the summer and winter. During the summer these ramps are covered with a material of synthetic properties which has the necessary ingredients for jumping. The wind is also a factor for jumpers in that it can have a large effect on the distance of the jump. With this being said, ramps are usually built and designed to shield the wind to protect jumpers from the wind variables affecting their results. Ski jumping is popular among spectators and TV audiences in Scandinavia and Central Europe. Almost all world-class ski jumpers come from those regions or from Japan. Traditionally, the strongest countries (with consistently strong teams) are Finland, Norway, Germany (formerly both East and West), Austria, Poland and Japan. However, there have always been successful ski jumpers from other countries as well (see list below). The Four Hills Tournament, held annually at four sites in Bavaria (Germany) and Austria around New Year, is very popular and draws huge crowds. There have been attempts to spread the popularity of the sport by finding ways by which the construction and upkeep of practicing and competition venues can be made easier. These include plastic "fake snow" to provide a slippery surface even during the summer time and in locations where snow is a rare occurrence. The ski jump is performed on two long skis similar to those a beginner uses, with a specialized tail fin that is somewhat shorter and much wider (so it will support the weight of the skier when he or she is on the jump ramp.) Skiers towed behind a boat at fixed speed, maneuver to achieve the maximum speed when hitting a ramp floating in the water, launching themselves into the air with the goal of traveling as far as possible before touching the water. Professional ski jumpers can travel up to 70 meters. The skier must successfully land and retain control of the ski rope to be awarded the distance. ↑ Ski Jumping - History Retrieved January 27, 2008. ↑ Copper Peak Retrieved January 27, 2008. ↑ FIS MEDIA INFO: Decisions of the 45th International Ski Congress in Vilamoura/Algarve (POR) Retrieved January 27, 2008. ↑ IOC approves ski cross; rejects women's ski jumping Retrieved January 27, 2008. Virmavirta, M. Limiting Factors in Ski Jumping Take-off. Jyväskylä: Jyväskylän Yliopisto, 2000. This page was last modified on 23 September 2015, at 15:04.